Problems traveling with your gear? Have you ever travelled to a wilderness trailhead using a major commercial airline? If so, what difficulties did you have taking your gear? Did you have to leave anything behind at a security checkpoint? When you claimed your checked bag, did you find that your gear was searched-through and it's contents disturbed? 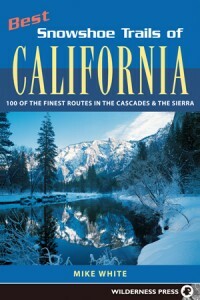 This wild places program presents a guidebook author's favorite places to snowshoe in California. Yeah, it's spring, but there's still a lot of nice snow up there. 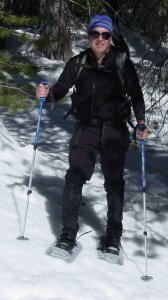 Mike White, author of Best Snowshoe Trails of California, tells us what he actually thinks are the very best snowshoe trails in California. He picks trails that start at this trailhead, and at this trailhead. Mike introduced us to snowshoe hiking two weeks ago, in our edition number 129, A Snowshoe Primer. Mike also mentions the option of staying overnight in a backcountry hut; one of the places we mentioned in our edition number 111, a reprise of Indoor Snow Camping. This outings program takes us on a patrol day with the Lake Alpine Nordic Ski Patrol. You can have a great time while helping others by joining a ski patrol. 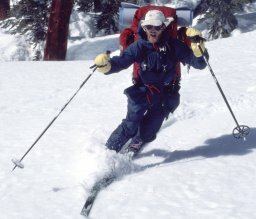 Steve joins the patrol skiing in the backcountry near Bear Valley, California. We hear from Charles Schafer, the patrol director for the Lake Alpine Nordic Ski Patrol. His group is affiliated with the Far West Division of the National Ski Patrol. Charles talks about the reason they're out there skiing the backcountry: To provide assistance to backcountry skiers and to make their experience safer. After the tour, Steve talked with Jeff Gurrola, the Nordic Supervisor for the Far West Division of the National Ski Patrol. 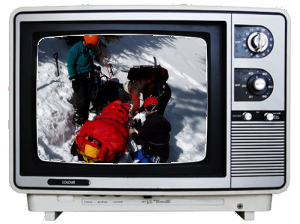 Jeff talks about how you can join up with a backcountry ski patrol. 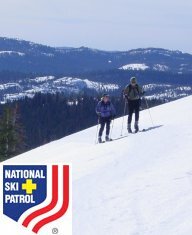 To join a ski patrol in your favorite backcountry area, you can start by contacting the National Ski Patrol and finding out about which areas near you have active patrols. Call their national office in Colorado at 303-988-1111. This skills program presents an introduction to winter hiking on snowshoes. If you can hike, you can snowshoe. Steve takes a hike with author Mike White, who wrote the books, Best Snowshoe Trails of California, Snowshoe Trails of Yosemite, and Snowshoe Trails Tahoe. A couple of weeks ago, they hiked out and back a couple of miles in the Tahoe National Forest near Donner Pass in California. Snowshoe hiking is the easiest way to start exploring the wilderness in the winter. Mike explains the gear you need, and how to get started. WildeBeat members can download an extended interview with Mike White featuring more detailed tips for getting started, from our WildeBeat Insiders web pages. This wild places program provides a ski guide's advice on how to get away from the crowds at the very popular ski resorts in Utah. Guest correspondent Kurt Repanshek visited the Mill Creek trailhead in the Wasatch-Cache National Forest near Salt Lake City. There he met backcountry ski guide and guide book author Tyson Bradley. 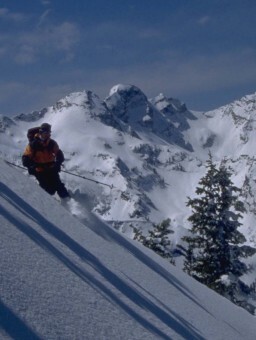 Tyson wrote the book, Backcountry Skiing Utah. Tyson talks about the many mountain ranges in Utah that provide a wide range of exceptional opportunities for backcountry and wilderness skiing, whether you're an advanced-beginner cross country skier, or you're an expert alpine or telemark skier. He points out that if you are comfortable on your skis, and you're fit enough to hike three miles and gain a thousand feet, then you're plenty fit to get into the backcountry on terrain appropriate for your skills. Tyson also mentions that sometimes in the deep, dry snow of Utah, you might have a greater chance to be at risk from avalanches. Our edition number 74, Staying on Top of the Snow, provides an introduction to avalanche safety. One of the most important things to do before you go out is to check with the Utah Avalanche Center for the day's forecast. Kurt Repanshek regularly writes and occasionally podcasts on his National Parks Traveler web-zine. In our edition number 125, titled "Forest Admission?" we read from the online writings of Tom Martin, co-director of the Arizona-based non-profit, River Runners for Wilderness. Tom wasn't available for an interview before our production deadline for that edition. Yesterday, Tom called in this comment about our story. After Tom's comments, and Steve's response, we include a a comment by Dave Simon, director of outdoor activities for the Sierra Club, about the range of reaction to the proposed Forest Service rule. 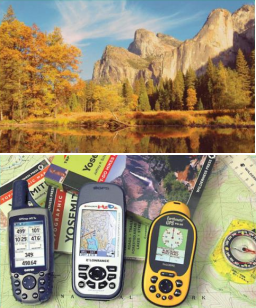 They came, they saw, they almost bought it; are these the kind of stories that inspire you to get into the wilderness? 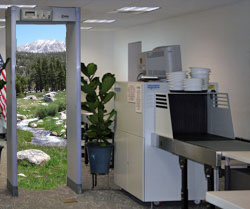 Do they represent the normal experience of a wilderness visitor? Tom Mangan, a newspaper editor, and hiking blogger. Emily White, marketing and publicity specialist for Wilderness Press. WildeBeat members can download extended bonus interviews with Andrew Skurka and Ryan Jordan from our WildeBeat Insider's web pages. A factual correction (and I should have mentioned it as it was posted the day we did the interview) is that we have extended the comment period to March 20, 2008. That will make the comment period a total of 150 days, hardly a "stealth tactic". 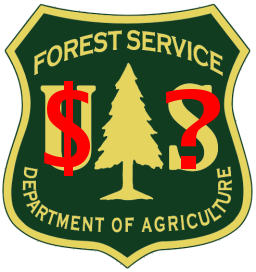 We'd also like to clarify that it wasn't our intent to assert that the Forest Service was trying to implement these rule changes without public scrutiny. Rather, our comment in the story describing the proposed rule changes as a semi-secret document was meant to be a comment on the relative lack of mainstream media coverage this issue has attracted. This wild places program examines proposed rules affecting outfitter guides in the National Forests. 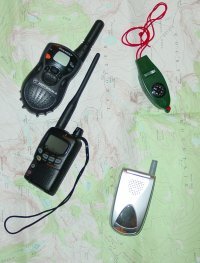 Will these rules make it harder, or more expensive, for you to get into Forest Service wilderness? Jim Bedwell, Director of Recreation, Heritage, and Volunteer Resources for the National Forest Service in Washington, D.C.
Matt Bloom, owner of the Kennedy Meadows Resort and Pack Station, on the edge of the Emigrant Wilderness in California's Stanislaus National Forest. The Forest Service issued a proposed rule change titled, Proposed Directives for Forest Service Outfitting and Guiding Special Use Permits and Insurance Requirements for Forest Service Special Use Permits. This rule is open for public comments through February 19, 2008. An Arizona-based group, the River Runners for Wilderness, sounded an ominous alert about some possible problems with this rule in November of 2007. Later, the Casper Star-Tribune published an article by Brodie Farquhar presenting the controversy. We suggest you take a look at the revised rules yourself, and then make your own comments to the Forest Service if you think your access will be affected. WildeBeat members can download bonus extended interviews from Todd Vogel and Jim Bedwell from the WildeBeat Insider web pages. This gear program is a report on the Winter 2008 Outdoor Retailer's Expo. What's cool in next year's winter gear? Jason Boyle and Christopher Nicolai report on the most interesting gear they hope to test for BackpackGearTest.ORG. They comment on products by: GoLite, Rab, Patagonia, Mountainsmith, MontBell, Cilogear, Aspen Aerogel, Easton, Garmont, and Teko Socks. As a wrap-up, Backpack Gear Test founder Jerry Goller tells us that they get more gear to review than their reviewers can keep up with. You might be able to get free gear to review. Read: How to become a tester.